Several types of viburnum are native to the First State. While generally assuming a shrubby form, species such as maple-leaf viburnum and southern arrowwood are among the most recognizable and common understory species in our forests. 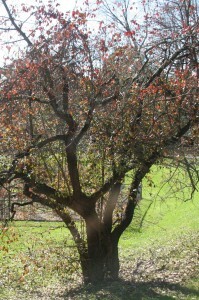 One species, blackhaw, tends to have a central stem and can achieve small tree status. Viburnums have showy flowers, provide ample food for wildlife, and make attractive ornamentals for landscape planting. Blackhaw viburnum has deciduous leaves that are small (2 to 4 inches long) and elliptical in shape.